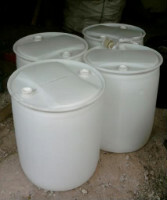 One of the big topics of discussion in the Rainwater Harvesting business is the use of recycled soda syrup drums as rain barrels. Detractors say that since the barrels are not designed for outdoor use they can eventually crack in the sun. Purpose built rain barrels, on the other hand, can withstand the elements, so are a better long term choice. Point taken. But from a user's perspective, you simply can't beat the price which is anywhere from $20 (on Craiglist) to "free" when donated by the local coke or pepsi bottling plant (example here). Coke and Pepsi bottlers make the donation for the PR of being been seen as a good corporate citizen. The use of these drums is also viewed as a positive by municipalies because landfill is reduced at the same time water is conserved and stormwater is prevented.